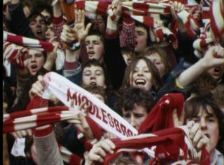 Middlesbrough on Film from Film Archives UK on Vimeo. Just as with many of our archive colleagues, for both the Yorkshire Film Archive and North East Film Archive one of the real pleasures of working with regional film collections is the ability to re-connect people with film made in, or about their own communities. For those of us who curate, and then present our films shows, the pressure is usually on – how do I find time to pull the content together, how much information do I need (and is it about films, specific local events and landmarks, or context through wider social history of the time – for me, the best shows include all three elements), where am I driving to on a cold Wednesday evening to give the presentation, how many people will be there, will they like it – and why on earth am I doing this? The answer is, without exception, confirmed by our audiences. We do it because the responses are so positive, the connections with the films so strong, and the amount of information that we accumulate and learn about our collections from our audiences is hugely valuable. Not only that, film shows regularly lead to the discovery of new collections, which find their way to the Archive, and in time complete the cycle as they become part of future screenings. As a presenter, you can generally gauge the audience reaction, and I try to stay as close to the audience as possible, keeping the dialogue going throughout the screening. Recently, I had the chance to go one better, being involved in the preparation for a large screening, but not being the presenter – that was the job of my colleague, Graham Relton, Archive Manager for YFA and NEFA, whilst I stayed seated, and part of an audience of over 440 people for the screening of ‘Middlesbrough on Film’ in the very grand Town Hall. 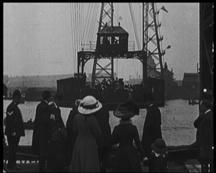 Hearing the buzz around me as the screening weaved its way from the opening of the Tees Newport Bridge in 1934, to the ‘witches hat’ swing in Albert Park (a favourite for several generations), to Ayresome Park and Charlton’s Champions in the 70s, and the launch of the last ship from Smith’s Dock in 1986 confirmed two things: that moving images that relate to people, place and a sense of identity and pride are immensely important, they bring people together, foster collective memories and renew friendships. And secondly, it is through our audiences that we can communicate a wider message about the cultural value of the collections we care for – people have a sense of ownership of these images, they have their own stories to share – you need only look at the comments on the Facebook site set up by Middlesbrough Council as evidence of that. Finally, our relationship with our audiences is hugely strengthened by our own personal passion and commitment to our collections, and there is little doubt of that at NEFA. Watching Graham presenting ‘Middlesbrough on Film’, I saw the pressures of finding and editing the content, researching the information, fighting the last minute technical checks, and the worrying about the audience reaction all slip away as the films started to roll, and he, and his audience, shared a screening that will be long remembered by everyone.